IF YOU’VE NEVER been to the Ozarks, then let me take you there. About an hour Southwest from the state of Missouri sits a town called Mountain View, Arkansas. 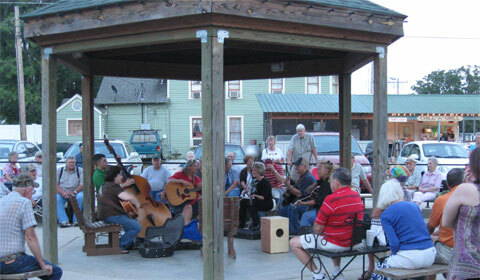 There is so much one can do in this quaint town, but the main reason people visit is for Pickin’ on the Square. Mountain View’s downtown historic district offers a wonderful park where every Thursday, Friday and Saturday local folk, along with visitors, gather to sit and listen to folk music played acoustic style. In fact, Mountain View is considered the “Folk Music Capital of the World.” Anyone who can play an instrument or just sing is welcome to pull up a chair and join in. The people there are amazingly friendly. When the sun begins to set, you will see people arriving and bringing their lawn chairs and staking out their places. The whole town lights up when the sun sets. The smell of funnel cakes from the Chill N Grill, chocolate fudge from the Fudge Factory and fresh coffee brewing makes it hard to keep your mind on the pickin’ and grinnin’. Children run and play in the park while mothers and fathers visit with friends and family. There is a sense of safety in this small town. Everyone watches out for everyone. People bring their dogs and they’re allowed to run through the park with freedom. Old friends who attend the same church will gather in a group and begin to play. 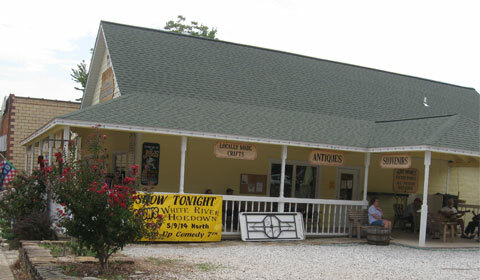 You’ll see fiddles, autoharps, dulcimers, banjos, guitars, mandolins and, of course, bass fiddles. You can listen to this group for a while and, when you get tired, just move your chair to another group and listen. You may think “How can this be?” with so many groups playing and singing at the same time; it’s because they only play acoustic instruments. No loud music and the singers don’t use microphones. 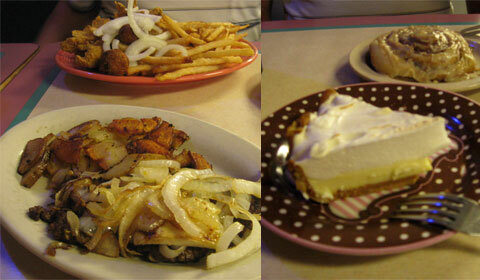 If you are ever in Mountain View, you simply must eat at PJ’s Rainbow Café. When you first walk in, you’ll notice it’s very small and you seat yourself. You’ll also notice a shelf running along the top of the café with all types of cookie jars for sale. Some of the ceiling tiles are actually business cards. The food is amazing and you get a lot of it. Our waitresses, Kristy and Margo, were super friendly. The service was fast and it turns out Robby, the man who brought our food out to us, is not only the cook, but the son of the owner. The atmosphere was so fun and friendly and relaxed, it made us not want to leave. 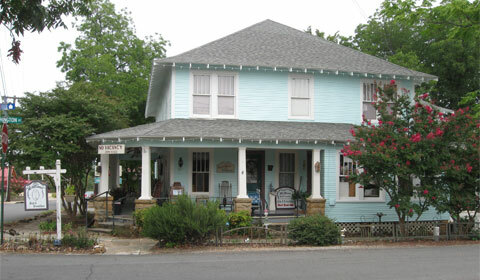 Mountain View offers several bed & breakfasts downtown: Wildflower B&B on the Square, Mountain View Music and Pinewood Cabins and Motel (although not a B&B it’s still within walking distance to the pickin’ square). 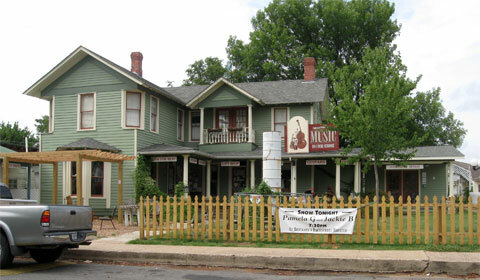 We stayed at The Inn at Mountain View on the courthouse square. I enjoyed sitting in one of the many rocking chairs on the long front porch. There always seemed to be a nice cool breeze blowing, and the porch offers ceiling fans also. 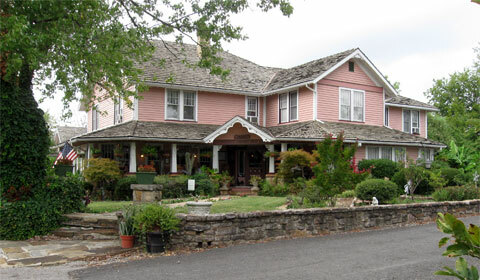 The inn, built in 1886, is decorated in period furnishings but with modern amenities. We enjoyed a full country breakfast including farm fresh eggs, bacon, biscuits and gravy. I recommend this inn to everyone. 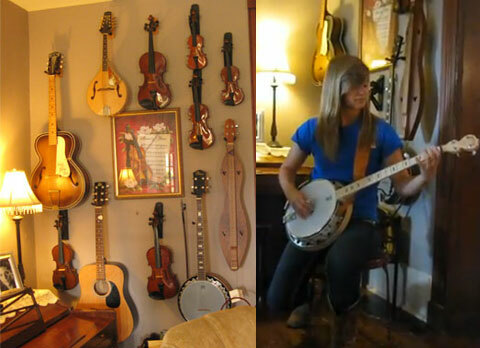 One of the guests staying at the inn with us was 17-year-old banjo player Ashlyn Orewiler from New Memphis, Arkansas. She and her mother drove three hours to Mountain View so Ashlyn could join in and play with the local groups. That morning at breakfast, I asked her if she would play for us and she was more than willing to do so. She has amazing talent and a very bright future in store for her. The Ozarks are a place of friendly, super-talented people. I will be going back soon to enjoy one of the many other festivals going on in Mountain View. I love the atmosphere and slow pace this town offers to locals and visitors alike. TERESA DAVIS was born and raised in Texas. 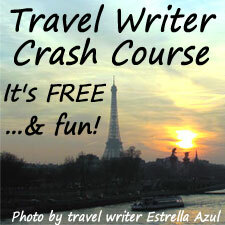 She is a writer on HubPages (tjdavis), tweets as @iluvmnts4x4 and blogs at teresadavisblog.com. She owns a business, Bella’s Scentsations, has a great family—husband of 18 years, two grown daughters and a wonderful granddaughter—and she loves travel and adventure! Great article Teresa. You made it feel as if I was there. Steve..thanks for reading and commenting. I’m glad you felt you were there. It is a fun place to visit. I’m now very hungry so, i want to talk about these delicious foods. also thanks for these glassy pictures. What a great article! I LOVE that you included some music videos….you really transported us there! Being a foodie – the cafe sounds FAB! 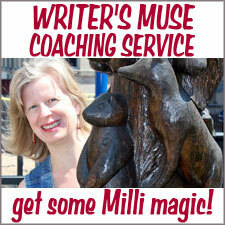 I hope we see more of your travels here on Millivers Travels! Thanks Estrella for reading. So glad you enjoyed and I’m so glad I can help everyone feel the slow and friendly atmosphere of Mountain View, AK. Such a cute small town! And I love those B&B! Me and Jaycee will have to go with yall next time! This article was so enjoyable. I just love old houses, and your B&B’s look and sound so relaxing, with the rocking chairs on the balcony’s and the music all around. Adding the video’s really showed that “down home” bluegrass vibe. I love writing and I also enjoy photography. visited Mt. View last summer & enjoyed every minute. Your pictures are treasures. My husband & friend were invited to join in on the picking on the square by some of the locals & it was such a joy to them. We stayed at Ms Nancy’s Inn on the Square & loved being so close to all the activities. Planning on a return visit this coming summer. The people in Mt. View are so friendly and everyone seems to be welcomed with open arms. We plan on visiting again and this time take our friends with us. It’s so lovely sitting in the square and just listening to all the music and watching the children running and playing.